Few settings lend themselves so well to explorations of violence as the Western. In an environment that’s naturally inhospitable and often isolated, where the law is impotent if even existent and basic amenities are scarce, force seems the only guiding principle. The weak have little choice but to bend the knee and scrape by while the strong, for all of their momentary bravado and power, are just a quick draw away from joining former victims. Such stories are primal in their appeal and almost uniformly brutal: stripped of society’s tempering influence and the luxury of excess, life reverts to conditions almost Neanderthal in their severity. Even the most romantic of Westerns, such as Ford’s Stagecoach, are tinged around the borders with a distinctly pessimistic gloom (to say nothing of the genre’s most brutal representatives. Blood Meridian stares unblinkingly and without apology into the abyss of human violence while The Searchers puts paid to the genre’s apologists’ thematic attempts to justify theories of manifest destiny with an ending of perfect, brutal irony). There’s no doubt Yasuhiro Nightow understood this when he chose a desert- planet named “Gunsmoke” as the setting for Trigun. The story is a Western through-and-through, in its desolate setting, in its gun-fetishism and in its thematic obsession with violence. There are obscuring elements of the space opera and steam-punk thrown in, but they’re only so much window-dressing: this is still a story about settlers who exists in on the fringes of civilization, well beyond the reach of law, in an environment where a dry well or an empty holster is a death sentence. Except where other writers posit that, at best, the only thing man can hope for in such a situation is little more than a stubbornly defended personal dignity (and the occasional vigilante justice), Nightow remains absurdly optimistic. Yes, certainly Trigun is full of enough carnage to satisfy any red-blooded teenage boy – the action is frenetic and panicked and blood abounds: at one point the hero Vash’s trademark crimson coat has soaked up so much blood it’s gone black; at one point a man is wrapped in bullets, is shot, and emerges from the resultant explosion a gibbering skeleton that manages, over the course of several excruciating pages, to regenerate to something resembling human. Limbs are shot off (the bone fragments and blood spatters are of course rendered loving), whole cities and species are wiped off the map by nuclear-level explosions and at some point a unit of police officers is squeezed into a truck until they’re all, as one villain puts it, “little more than hamburger.” It all sounds impossibly bleak and, in certain hands, it would be. 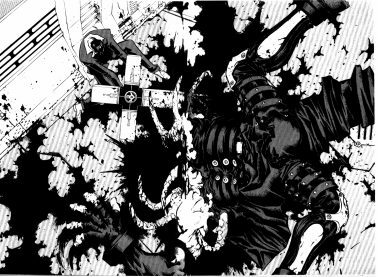 The mayhem here conceptually dwarfs anything you might see in other ultraviolent manga such as Akira or Hellsing but, in practice, raises only as many hackles as a slightly off-kilter Looney Tunes skit. It has none of the sense of scope or scale of its more respected contemporaries and absolutely none of the gravitas of its Western peers; worse, it has more optimism than it needs. This doesn’t make for an unpleasant experience, mind you, because for all its faults Trigun is essentially entertaining, but it does make for a muddled, self-contradictory mess that, thanks to a deeply misjudged pace, turns into an outright slog in places. 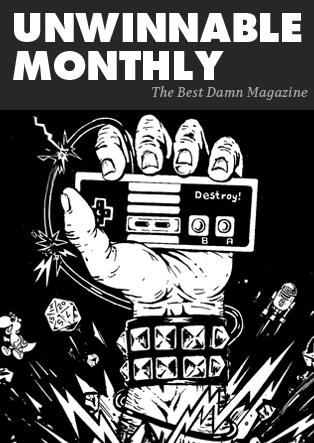 So many mistakes might, in fact, be traced to Nightow’s style. Though it often appears sketchy and though the often pencil-thin lining-and-inking lend his work a slightly incomplete feeling, they complement the kinetic pace of each battle perfectly. The four way tussle between Vash, Wolfwood, Grey the Ninelives and Leonov is one of the most panicked sequences in comic history, cutting back-and-forth without any real logic between Vash’s battles with a horde of life-sized puppets and Wolfwood’s brutal fight with a monster assembled from mounds of limbs and yet never missing a beat. 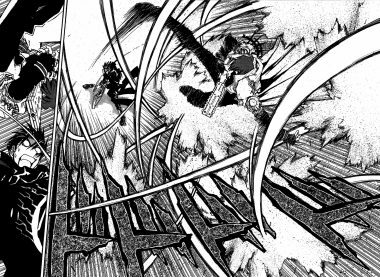 Again, Vash and Wolfwood’s tag-team against Livio, Razlo and Chapel is one of the most delightfully twisted and over-the-top shoot-outs of all time, a fight that begins with a mid-air headbutt so momentous it sends a man flying and snaps his spine and not ending until each combatant has been killed four or five times apiece. It’s hard to read panel-by-panel; the frenetic style almost demands more that you parse the entire page as one unit, but eventually you’ll find that it works perfectly and possess a sense of movement unrivaled elsewhere. Character designs are distinctive and regularly appealing (though it’s easy to get tired of the Gung-Ho Guns’ often generic “anime” designs and find yourself wishing that Nightow didn’t waste the delightfully grotesque and playful designs of his cyborgs on bit-players) and the man knows his mechanical designs like few in the business. The problem is that no amount of artistic talent can make up for a fundametal dissonance between art, atmosphere, and theme, especially not when its exactly this joyful, playful violence that undermines what Nightow claims he’s really interested in. This article will be concluded in Part 2, posted next Wednesday at 12:00 PM.